Finding the perfect gift for someone can be hard. Relieve some of the holiday stress with the Gracious Gift Bouquet. 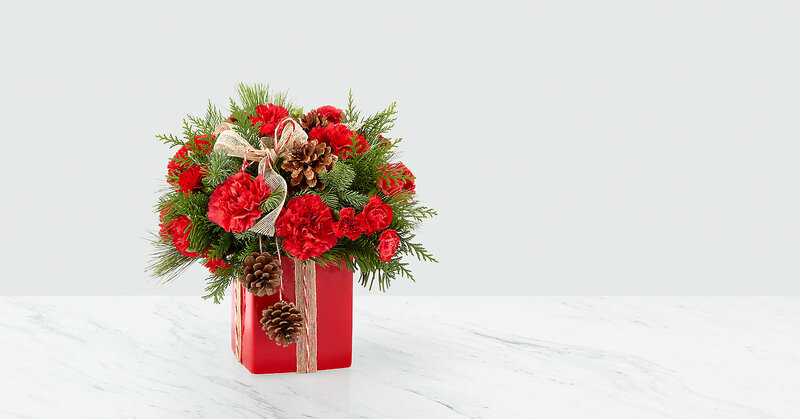 This artful arrangement of red roses and carnations accented by pinecones is set in a seasonal red ceramic present vase; a stunning gift that they will never forget. GOOD bouquet is approx. 11"H x 11"W. BETTER bouquet is approx. 12"H x 12"W. BEST bouquet is approx. 12"H x 13"W. EXQUISITE bouquet is approx. 13"H x 14"W. Your purchase includes a complimentary personalized gift message.